Last week I popped along to the head offices of online diamond shop Vashi Diamonds. Run by diamond expert and celebrity favourite Vashi Dominguez, the company is the fastest growing online jewellery brand. The offices on a beautiful street off Hatton Garden in London, house a large team of staff including a fantastic customer service team to answer any queries. I was the first to arrive so I got a little tour of the offices including some consultation rooms for customers who would like to see the jewellery in person before ordering online. There are also press clippings in frames all round the offices, Vashi Dominguez often appears as a diamond expert on the TV and in print as well as having many celebrities amongst his list of clients so he has quite a high-profile in the media. 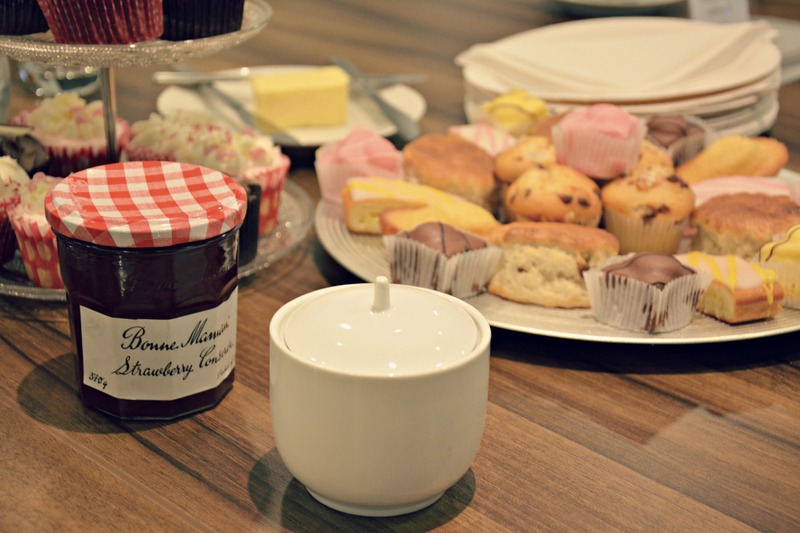 The reason for my visit on this occasion was a vintage style afternoon tea organised by the PR team along with a fascinating presentation on the history of the diamond engagement ring. We then got to try on a selection of vintage inspired jewels from the Vashi collection. I couldn’t help but try on as many as possible, they were all so pretty! I was also lucky enough to win this beautiful pair of diamond earrings in the competition they held for the bloggers who were there. Aren’t they beautiful? They’ve taken pride of place in my antique jewellery box. All Vashi diamonds are handpicked to be of the very best quality and come from conflict free sources. 1. An example of the type of diamond rings worn in Roman times. This one features a pyramidal point cut set in a gold band. 2. The first recorded diamond engagement ring was worn by Mary of Burgundy in 1477. Photographed is a similar ring. 3. The Chequers ring (1575) belonged to Queen Elizabeth I and contained diamonds, rubies and a pearl. It opened to reveal a picture of her mother. 4. This gold and diamond signet ring (1628) was given to Henrietta Maria by Charles I. 5. The first brilliant cut diamonds were introduced in the mid 1700s by a venetian polisher Vincent Perruzzi. This cut also known as a cushion cut made the diamond look more sparkly. 6. Marie Antoinette wore a blue pear cut solitaire diamond ring (1770) This era saw the introduction of fancy coloured diamond engagement rings. 7. 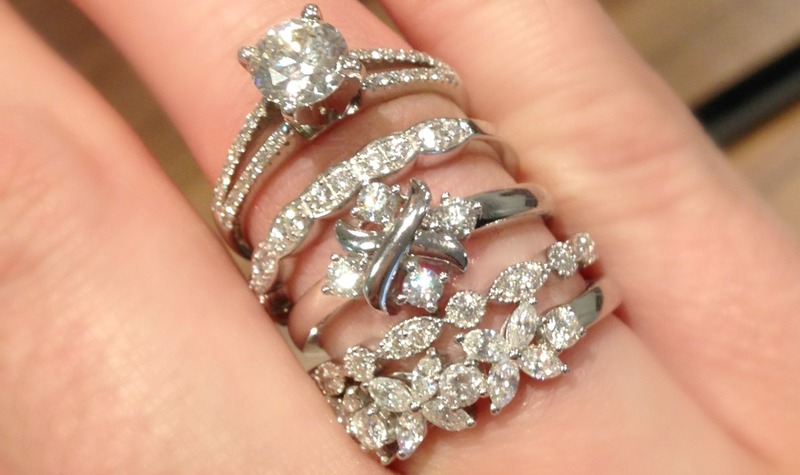 During the Victorian era there were many changes to the style of engagement rings. Coloured gemstones became very popular, with different colours representing different sentiments. 8. New trends during the 1800s included half hoops of diamonds, three stone diamond rings and Old Mine cut diamonds surrounded by smaller gems. 9. This unusual serpent ring (1839) was given to Queen Victoria on her engagement to Prince Albert. The serpent is an ancient symbol of protection and eternity. 10. In the late 1800s the Belle Epoque and Art Nouveau movements saw the next great age of the diamond. including the classic single stone open prong setting. In 1886 Tiffany & Co. introduced the 6 prong Tiffany setting. 11. The 1920s saw the Art Deco era, rings of the ear were often platinum or white gold and featured baguette, shield shape, or tiny round diamonds. Ruby, sapphires and emeralds were included to add coloured accents. 12. In the 1930s fishtail rings were introduced. 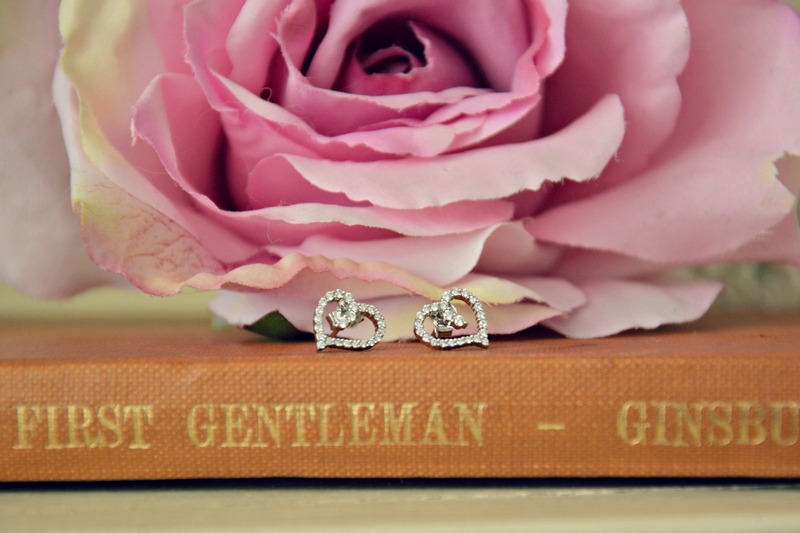 They had thick trip-tipped prongs with a few small diamonds set into the shoulders. 13. During wartime platinum was reserved for military use so 14k gold became popular. It also became popular to set the diamond in a white gold head on a yellow gold band. 14. When Grace Kelly became engaged to Prince Rainer of Monaco in 1956 she was given a 10.47 carat emerald cut diamond ring worth around £600k. Elizabeth Taylor is known for her love of large diamonds. When she became engaged to make Todd she received an emerald cut 29.4 cart diamond worth over £million. 15. In the 1970s the Marquise cut diamond was introduced. 16. When Lady Diana Spencer became engaged to Prince Charles in 1981 she wore a 12 carat over blue sapphire surrounded by 14 small solitaire diamonds set in 18k white gold. It was eventually given to Kate Middleton on her engagement to Prince William. 17. Large coloured diamonds worth huge sums of money have become popular for celebrity engagements in the 2000s. 18. Mary-Kate Olsen’s engagement ring (2014) features a 1953 vintage Old European cut diamond framed by 16 sapphires with side petals set with single cut diamonds. 19. The most popular diamond shape today is the Solitaire diamond. I hope you enjoyed this little travel through the history of diamond rings. I found it really fascinating. 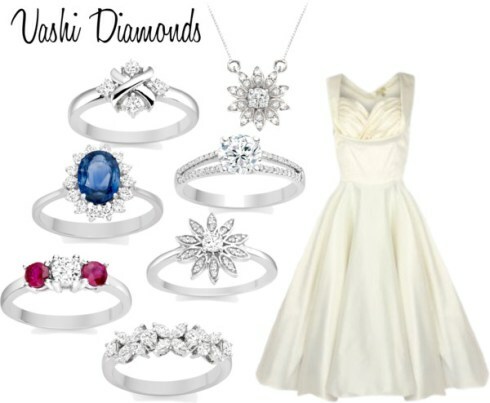 View the full range of diamond and gemstone jewellery on the Vashi website. Well done on the win! They are so pretty.